Did you know that regular wellness exams are one of the most important things you can do to keep your pet healthy? It’s true. The American Animal Hospital Association (AAHA) recommends annual wellness exams at a minimum of once every year and as your pet ages, they suggest an increase in frequency of visits. That’s because each year your pet misses a physical examination is the equivalent to you not seeing your own doctor for 6 or 7 years. In fact, according to the American Association of Feline Practitioners, a whopping 60% of just cats alone could live 4 years longer or even more if only they were to have regular annual veterinary care. Because our pets age so much faster than we do, regular wellness exams are one of the best ways that you can help your pet live a long, healthy life. We all want our pets to have happy, healthy, long lives. Unfortunately, they can’t always tell us when he or she isn’t feeling well. Animals are masters at suppressing symptoms so as to not worry us. Usually by the time they can no longer hide how bad they feel, their sickness has been going on for quite a while. The benefit of early detection allows time for steps to be taken to manage or correct a problem before irreversible damage occurs. For this reason, we encourage you to bring your pet in for a yearly physical examination as our trained veterinarians can help detect early warning signs of illness and help keep your pet happy and healthy. Call to schedule your pets next wellness examination today! A wellness exam is a comprehensive overview of your pets health including: oral, otoscopic (ear), ophthalmologic (eye), cardiothoracic auscultation (heart and lungs), abdominal palpation, orthopedic and rectal examination. Think of it as a simple and effective way of broadly monitoring your pet’s overall health. Wellness examinations do not necessarily mean that your pet is going to be subjected to a barrage of complicated or costly medical tests and treatments. While some animals may need close monitoring of blood work, x-rays or other tests, many pets benefit simply from being physically examined, having their heart and lungs listened to and their general health assessed as to prevent a major health issue from developing undetected. This also gives us the opportunity to analyze and record baseline values, such as temperature, body condition, and lab work. 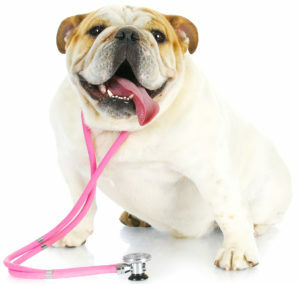 We measure these when your pet is healthy, in order to provide better care in the event of illness or emergency. A dental health exam and a weight check are always important parts of a wellness exam, and may indicate problems that can progress rapidly and can have a significant impact on your pet’s overall health. To go to our dental services page click HERE. During a wellness exam, our veterinary team will start out by taking your pet’s vital signs. Typically, your veterinarian will ask for a complete history of your pet’s health including eating habits, exercise, unusual behavior, etc. and do a comprehensive examination of your pet from nose to tail. Your veterinarian may also perform diagnostic tests such as blood work, urinalysis or intestinal parasite tests and vaccines may be administered (depending on your pet’s life stage). Additionally, disease screenings (heartworm, kidney, liver, blood disorders, etc.) may be recommended, depending on the state of your pet’s health. Listen to the heart – Early signs of cardiac disease such as heart murmurs and abnormal heart beat patterns known as arrhythmias can be heard through a stethoscope. Discovering these initial indicators of trouble can lead to identifying and treating the underlying condition before it becomes a more serious health threat. Listen to the lungs – Health issues such as infections, obstructive diseases and other problems can be detected by listening to your pet’s lungs through a stethoscope. The doctor can also assess the overall pulmonary health of your pet. 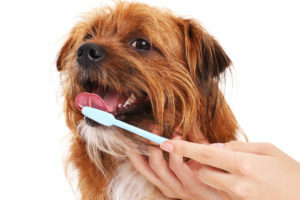 Check the teeth and oral cavity – Examining your pet’s teeth and mouth is an important part of preventing dental disease, which is one of the most common health concerns in pets. Very young animals, such as kittens and puppies, also need to be checked to ensure they are developing an appropriate bite and that they are losing their baby teeth at the right time. We also take the time to discuss proper home dental care with you. Evaluate vision – All diseases follow relatively predictable processes and if found early can be more easily treated. Ocular conditions, which can also be prevented through regular care and screenings, are no exception. Look into the ears – As with dental disease, ear disease is relatively common in many types of pets. Issues such as low-grade allergies, swimming or bathing, reactions to certain foods, mites and other parasites can all cause and contribute to otitis or ear disease. Though you may feel this is an area that can be well-handled at home, the fact is that many ear diseases are difficult to detect and require medical treatment. Palpate the lymph nodes, abdomen and skin – By feeling the skin, we are looking for unusual lumps or swellings as well as evaluating for skin discolorations, lesions or patterns of hair loss or thinning. These can indicate the presence of more systemic problems, especially metabolic diseases, which most commonly occur in middle-aged animals. Palpate joints and muscles – By examining the joints, legs and other areas of the body, we are able to evaluate for swollen joints, decreased muscle tone and variations in muscle size between the limbs. We also observe your pet’s gait for developmental issues. In puppies, we look for early indications of hip or elbow problems. For older pets, we look for signs of arthritis, which can be well-treated if found early. The veterinarians at the Animal Clinic of Billings recommend several laboratory tests in order to keep your pet healthy. These tests include a heartworm test, parasite screening, and a full blood workup. Not only can a chemistry panel and complete blood count identify the presence of underlying disease processes, but these tests help create a baseline should your pet become ill between routine examinations. Additionally, blood work is necessary if your veterinarian recommends a dental cleaning, removal of skin masses, or any other procedure that requires anesthesia. 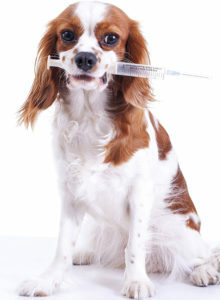 Vaccinations are the cornerstone of your pet’s preventive health care plan. Just like humans, animals are at risk of contracting a number of different diseases during their lifetime. Fortunately, vaccinations are available to protect your companion from these threats. Vaccinations have become increasingly safe and effective over the past years and are an effective way to help prevent such diseases as Rabies, Distemper Virus, Parvo Virus, Leptospirosis and Bordetella (Kennel Cough). Advances in veterinary immunology have made diseases that once were fatal to pets easily prevented. Today, many immunizations and preventative treatments are available that did not exist just a few years ago. 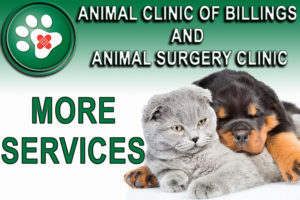 At the Animal Clinic of Billings, we always tailor your pet’s vaccination schedule according to his or her needs. All decisions about vaccinations and preventative care are made jointly by one of our veterinarians and you in order to develop a vaccination protocol based on your pet’s lifestyle, environment, and other risk factors.